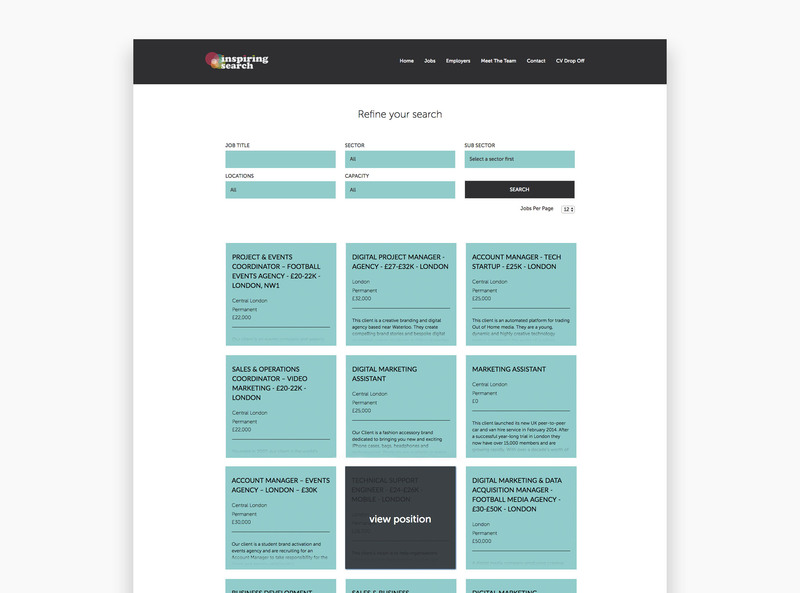 Inspiring Search had approached us to provide a complete UX, UI and development overhaul of their recruitment platform. Their current web presence wasn't meeting the requirements, and wasn't integrated with their recruitment CRM Bullhorn. This mean that they would have to manually publish job roles twice - once through their CRM and then again through their website. After undertaking an in-depth investigation into how the business operates, we understood that Inspiring Search needed to appeal to both recruiters looking to place candidates, and candidates looking for jobs. We developed a split user interface, providing two clear and separate paths for each type of clientele. By assigning a colour pallet to each type of client, we were able to establish clear user journeys through the website. 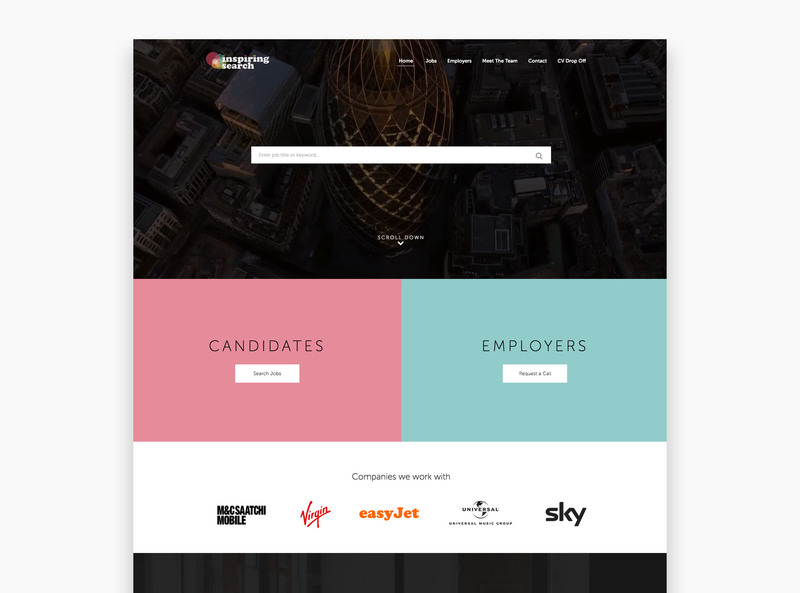 In order to improve efficiency within the business, Original People integrated the Bullhorn recruitment platform directly into Inspiring Search's new website in order to automate job posts, manage applications and process CV's. By providing a unified platform, we were able to increase productivity by reducing time consuming processes. Each job post created through Bullhorn, can now be pushed to the new Inspiring Search platform effortlessly. All job post data pulled into the new platform, could now be consolidated and filtered according to the candidates requirements. Candidates are now able to apply for jobs directly through the platform, without needing to submit applications via email as they had previously needed to. By developing an integrated CV application form and social media sharing, Inspiring Search have seen an increase in applications for job posts - enabling them to grow their diverse candidate database. 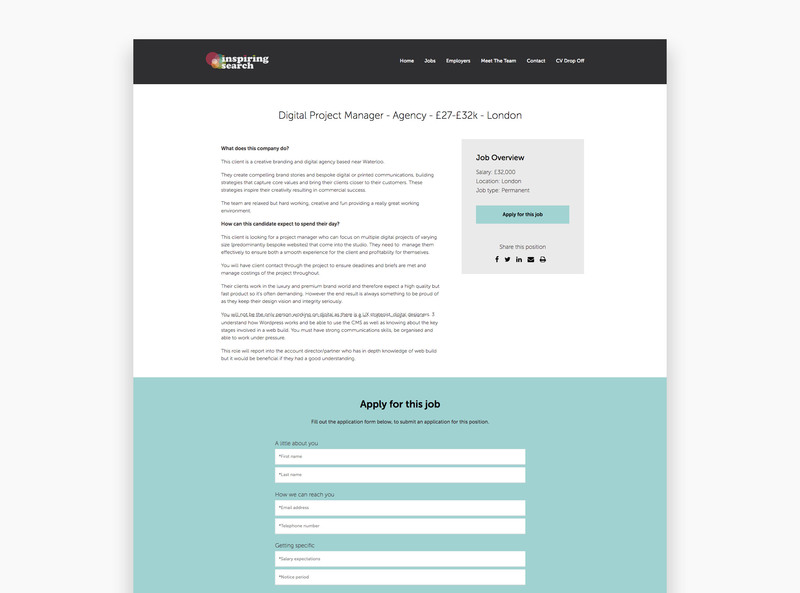 By integrating a "CV Drop Off" pop-up, we were able to facilitate candidates in supplying an application at any point during their browsing experience. 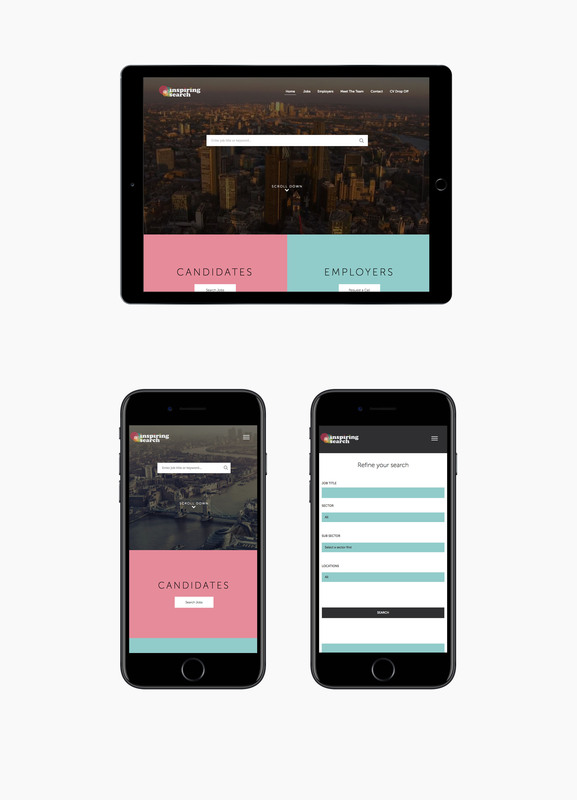 Ensuring that candidates and employers could both traverse through the newly designed platform on tablet and mobile devices, was crucial to its success. We embarked on a rigorous testing and analysis process, to ensure that the platform responded with pixel perfection on a multitude of devices.